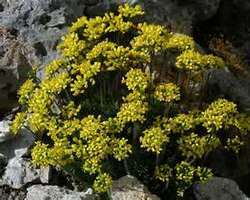 Alpine Draba is a slow growing, small mounding plant that has deep green foliage that will stay semi-evergreen through the winter. It will bloom in early spring to mid spring and will be covered with bright yellow flowers. It will grow to a height of 2" to 4" tall and 6" to 8" wide. Plant Alpine Draba in full sun and well drained soil. Plant Alpine Draba in an Alpine Garden, Rock Garden, Moon Garden or in a container. It will become drought tolerant once it is established. Keep it away from more vigorous growing plants as they may overtake this cute little mound.